I hope everyone is doing well and, if you are in the Northern Hemisphere, are safe from the hurricanes and enjoying some cooler weather. Even though it is definitely the end of the summer season, I had the new Tilly and The Buttons Seren dress in my sewing queue and really wanted to get one made up before the cold weather hit. While I’m pretty sure I missed the window for sundresses, I came up with three ways I can wear this dress into Fall and beyond! Let’s stat with the pattern. Like I mentioned before, this is the Seren dress by Tilly and The Buttons. She released this pattern just a couple of months ago and I snagged it up along with the Stevie dress that she released at the same time (btw, I love this pattern as well and hope to do a review of it at some point!). There are three different views in the pattern and I opted for the plain version, although the one with the flounce is totally getting made next summer! 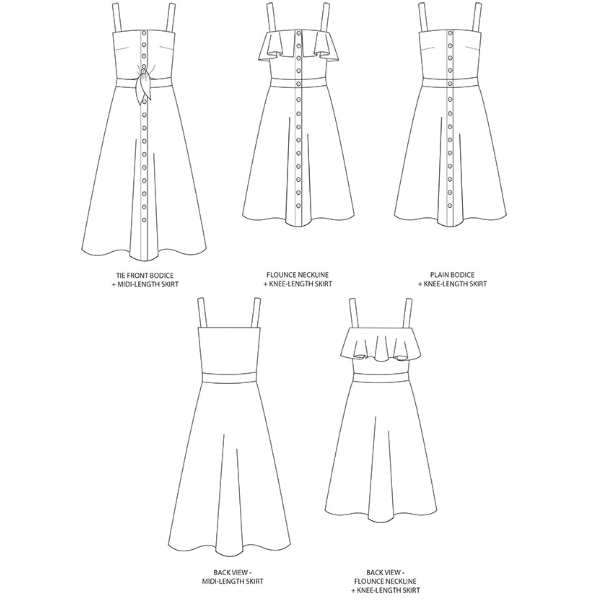 If you are a beginner seamstress then you need to have a look at the TATB patterns. She is a master at creating beautiful patterns that are easy to construct. Her instruction booklets are almost sewing courses in and of themselves. This dress was no exception. It went together VERY quickly. I was able to alter the pattern, cut out the fabric, and construct the entire dress (except for the hem) in one day. I left the hem for 24 hours to drop and I am SO glad that I did. The fabric I used is a Tencel from Blackbird Fabrics. While this is an absolute dream to wear, it is very shifty which can make for some very frustrating sewing. Even though I staystitched EVERYTHING I still had some pieces that distorted and even grew. The hem alone grew 4 inches in some places! While I love how this dress turned out, and while I know it will get a ton of wear next Summer, I needed to figure out a way to wear it now. These are just 3 ways that I have styled this dress so it can be worn now, in the Fall and even into the Winter! While none of these combinations are earth shattering (really it’s just a matter of wearing another layer over or under), I’m very pleased with the variety I was able to scrounge up. In this iteration, I layered the dress over my Rowan turtleneck and then paired it with a pair of mules. This outfit has some great potential for the in-between weather we are getting at the moment. This one makes a slight nod to the cowgirl trend that was seen on the F/W 18 runways this year. While I will not be going full on cowgirl, I do like the way the boots and added belt give it a nod. This is my white M6649, which is an out of print pattern, but one I really enjoy. So, there you have it. Sundresses can and should be worn after Labor Day! I have a video up on the channel that will show the outfits in movement. If you like what you see over there, I would love it if you would hit the subscribe button! That way, you will never miss out on one of my weekly videos!